With this being the season for engagements, you don’t want to forget to properly insure your valuable engagement rings or other jewelry by scheduling them on an Inland Marine Insurance Policy. Did you know that theft of jewelry is always capped at a certain dollar amount in your homeowners or renters insurance policy? Each company varies a little, but it could be as low as a $1,000 theft limit. Is that enough coverage for your priceless engagement ring? What happens if you misplace it, lose it or the diamond falls out? In the base homeowners or renters insurance policy, there is no coverage if that happens to you. Your best bet is to schedule the jewelry on an Inland Marine insurance policy. 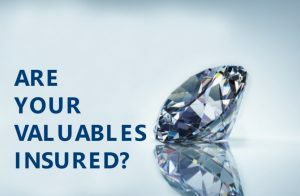 When your engagement ring is scheduled and you lose it, misplace the ring or a diamond falls out or it’s stolen, you now have insurance coverage for your engagement ring up to your scheduled limit. Another issue you could have is if your engagement ring is a family heirloom that can’t be replaced. But you have replacement cost on your home insurance you say? Well, with replacement cost, you MUST be able to replace the ring. If it can’t be replaced, the insurance company is only obligated to pay you the actual cash value of the ring. This means they will apply depreciation. You avoid this when you schedule the ring on an Inland Marine Policy. The insurance company is then obligated to pay you the appraised value of the ring. The same goes for any other collectible item that can’t be replaced. An Inland Marine Insurance Policy isn’t just exclusive to Jewelry. You can schedule guns, musical instruments, hearing aids, camera equipment, collector card sets, silver ware sets, longaberger baskets and many other items.